When it comes to character this home fits the bill! As you enter the front door you are greeted with a spacious foyer. To the left is a flex room with brand new carpeting and it abuts the large master bedroom. The updated master bath has a gorgeous double sink vanity and walk in shower. 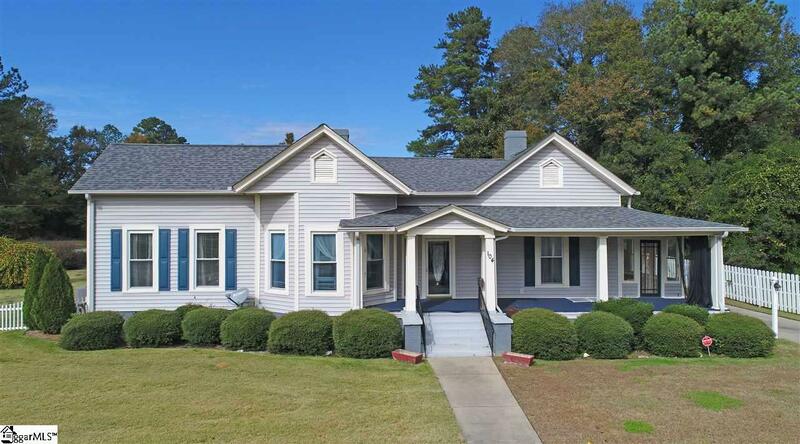 The other side of the foyer offers 2 additional bedrooms, one with original hardwood floors that also offers a private entrance to the nice sun porch on the side of the house. The back of the home offers the formal dining room with a brick wood burning fireplace. You then pass through the french doors into the Carolina Room that leads out to the back deck. From the Dining Room you can also access the large eat in kitchen with expansive counter space and tons of storage in the 20+ cabinets! You can access the large laundry/mud room from the foyer or the kitchen and to give you even more versatility there is a large room off of the mudroom with a bath that use to be a bedroom (current owner removed the closet to use it as additional living space) which could easily be converted back into a fourth bedroom or continue to be used as a living space. NEW carpet was just installed in this bedroom/living space on 2/21/19! There's a covered front porch with plenty of room to relax on your favorite rocking chair. There's a large workshop building in the back and several combined storage units for all your storage needs. This home has had several recent updates: A new roof was added to the house and workshop in the fall of 2016. New stairs to the second story of the workshop were added and the outside painted along with the outbuildings. Vinyl siding was added to the home in 2017 along with new gutters. New flooring was installed in the middle bedroom, kitchen and foyer. New windows were installed in the kitchen and back hall. The 2 smaller bathrooms were tiled. If you are looking for a home that could fit any need, please don't miss your opportunity to see this one. Located just 19 miles from downtown Anderson and 32 miles from downtown Greenville offers you an easy commute after a long day to peace and tranquility!